View More In Bandages & Bandaging Supplies - Page 2. Mepitel One #289500 measures 4"x7.2" and features a one sided soft silicone wound contact layer. Mepitel One minimizes trauma to the wound and pain to the patient during dressing changes. It is a newly launched one sided version of Mepitel that utilizes the product benefits from Mepitel, but is easier to handle. As with the Mepitel, Mepitel One can be left in place for up to 14 days depending on the condition of the wound. This reduces the necessity for frequent primary dressing changes. 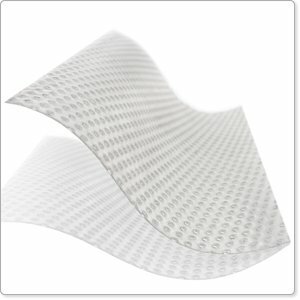 The porous structure of Mepitel One allows exudate to pass into an outer absorbent dressing. The Safetac layer prevents the outer dressing from sticking to the wound and ensures atraumatic dressing changes. Box of 10 individually wrapped dressings. This item ships for FREE! If you have any questions about this product by Mepitel, contact us by completing and submitting the form below. If you are looking for a specif part number, please include it with your message.